Signing bonuses may be negotiated for experienced or managerial positions at SGA! Seattle Gymnastics Academy is looking for an individual to work directly with the President and Brand Leader on developing and executing a marketing strategy that effectively communicates our vision, mission and core values to current and prospective families through different marketing channels and social media. Our recreational coaches are the lifeblood of SGA. With the widest variety of classes to coach, we are always looking for new coaches who are passionate about teaching and having fun. Our recreational coaches work in an exciting, high-energy environment where they develop strength of mind, body and character in our gymnasts. At SGA, we believe in teaching our gymnasts to “get up when we fall down, think about what happened, make a correction, and try again.” We offer flexible scheduling, career growth opportunities, competitive pay and more. 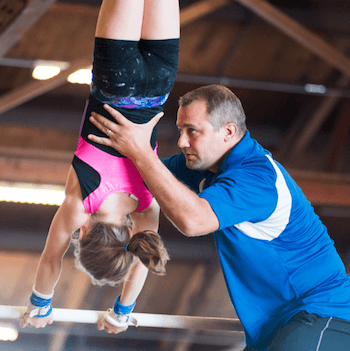 A background in gymnastics is preferred, but our comprehensive training program will set you up for success, even if you are new to gymnastics. Member Services Coordinators are the face and voice of SGA. They are essential to the success of our kids, coaches, and SGA as a whole. They are a guide for parents and provide exceptional customer service. All Member Services Coordinators go through a training process to build confidence, become skilled problem-solvers, and be proficient at finding the best fit for the child based on their personality and skill-level. Our team coaches are dedicated to gymnastics, have an eye for detail, and are willing to build gymnasts from the bottom up! We are always searching for passionate coaches who enjoy watching their gymnasts grow into serious competitors. SGA Team Coaches pride themselves on their commitment to providing a safe, positive environment where our gymnasts can develop and flourish. Our boys recreational and team classes are quickly expanding and we are looking for coaches to teach a variety of events including: vault, rings, high bar, parallel bars, floor and pommel horse! Boys’ coaches enjoy working in a fast-paced, dynamic environment and have the opportunity to become role models for our gymnasts. Our Xcel coaches are dedicated to gymnastics, have an eye for detail, and are willing to build gymnasts from the bottom up! We are always searching for passionate coaches who enjoy watching their gymnasts grow into competitors. SGA Xcel Coaches pride themselves on their commitment to providing a safe, positive environment where our gymnasts can develop and flourish. We are always looking for talented Xcel coaches to join our staff. Our special events coaches participate in a variety of weekend events including birthday parties, off-site events and Parent’s Night Out. We are looking for coaches who enjoy working with a variety of ages at fun events throughout the year. A background in gymnastics is not required; if you have a passion for fitness, working with kids, and having fun, apply today! Our comprehensive training program will set you up for success, even if you are brand new to gymnastics! Our TNT program is quickly expanding and we are looking for coaches to teach beginner to intermediate classes. SGA TNT coaches pride themselves on their commitment to providing a safe, positive environment where our gymnasts can develop and flourish. If you have experience or interest in coaching trampoline and tumbling classes, apply today!. SGA’s Day Program allows for gymnasts as young as 12 months old to start learning, moving and tumbling on age-appropriate equipment. Day classes are geared toward helping kids develop coordination that improves reactions, physical corrections and body alignment when walking, standing, running, or jumping! We are in search of a Day Program Leader to grow and manage the program at Ballard SGA. If you have coaching experience and are looking for the next step in your career path, apply today! We offer flexible scheduling, career growth opportunities, competitive pay and more. Our special events leaders at SGA drive our business beyond our scheduled programs. They oversee, coordinate, and participate in a variety of weekend events including birthday parties, off-site events and Parent’s Night Out. We are looking for a leader who enjoys working with a variety of ages at fun events throughout the year. A background in gymnastics is not required; if you have a passion for fitness, working with kids, and having fun, apply today!